WASHINGTON — President Barack Obama ramped up pressure on Republicans Monday to avoid a post-midnight government shutdown, saying that failure to pass a short-term spending measure to keep agencies operating would “throw a wrench into the gears” of a recovering economy. Late Monday, Obama called Republican and Democratic congressional leaders but there was no breakthrough in the budget impasse. Earlier, Obama urged House Republicans to pass a short-term spending bill free of any conditions that would weaken the nation’s 3-year-old health care law. 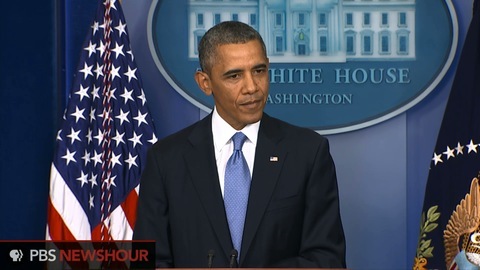 Obama spoke after the Senate rejected a House proposal to delay implementation of the health care law. House Republicans were preparing to vote on another stop-gap spending measure Monday, this one putting off a requirement that people must obtain health insurance. The White House issued a veto threat to that proposal shortly after GOP leaders announced it. House Speaker John Boehner, R-Ohio, has been under pressure from conservatives to use the stopgap spending bill and subsequent legislation to raise the nation’s borrowing authority to delay or cut federal finances to the health care law as a way of stopping it in its tracks. The health care law is entering a crucial new stage on Tuesday when people begin to sign up for the insurance marketplaces set up under the law to help the uninsured. “One faction of one party in one house of Congress in one branch of government doesn’t get to shut down the entire government just to refight the results of an election,” Obama said in the White House briefing room. The spending fight is a prelude to the bigger confrontation over the nation’s credit limit, expected to hit its $16.7 trillion cap in mid-October. Obama on Monday urged Republicans not to saddle the legislation to increase the debt ceiling with measures designed to undermine the health care law. He has vowed not to negotiate over the debt ceiling, noting that a default would be worse for the economy than a partial government shutdown. On Wednesday, Obama is scheduled to meet with top Wall Street CEOs to discuss the state of the economy, including the debt ceiling. The meeting is with members of the Financial Services Forum, a trade group representing the 19 biggest financial service institutions doing business in the United States, including Goldman Sachs, Bank of America and Citigroup. The Forum joined 250 other business organizations in a letter to Congress on Monday calling on them to avoid a shutdown, raise the debt ceiling and then address long-term spending issues and deficits. Monday evening, Obama called Boehner, House Minority Leader Nancy Pelosi, D-Calif., Senate Majority Leader Harry Reid, D-Nev., and Senate Minority Leader Mitch McConnell, R-Ky. The call with Boehner lasted nearly 10 minutes. Boehner spokesman Brendan Buck said Boehner told Obama that the health care law was costing jobs.